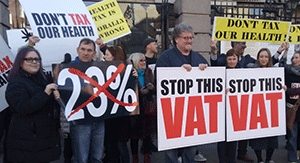 The threat to add 23% VAT to supplements has now been put off until November to allow the Government to legislate an acceptable alternative. The move, which was to have come into force on 1st March, was unexpectedly deferred as a petition signed by 75,000 people was presented to the Irish Parliament and Revenue offices. But the fight isn't over with campaigners determined to make sure the threat never materialises. In just three months following Limerick City and County Council’s launch of the project with a number of partners including the HSE and Healthy Ireland, 'We’re Breastfeeding Friendly' has encouraged a total of 73 Limerick establishments, including hotels, restaurants, shops, museums, sports clubs, community organisations and churches, to sign up for the campaign. The drive is aimed at improving the health and wellbeing of breastfeeding mothers, babies and their families by encouraging businesses, organisations and communities to become ‘Breastfeeding Friendly’. Mothers breastfeeding in the premises will never be asked to move to another area or stop breastfeeding. With the display of a ‘We’re Breastfeeding Friendly’ window sticker and/or poster other local authorities around the country will be rolling out ‘We’re Breastfeeding Friendly’ in their counties/cities. Follow the campaign online with the hashtags #breastfeedingfriendlylimerick and #LKWorkingTogether. One lucky reader has won a fabulous hamper of lavera natural and organic beauty goodies worth over €160. The winner of this fabulous prize is Deirdre Ferry. 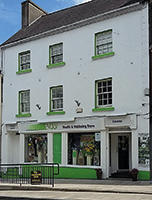 Get down to Evolv Health and Wellbeing in Enniscorthy, Co Wexford for their annual Spring into Health Week from 25 February to 2 March. Evolv have up to 50% off offers on supplements, €10 facials with Dr Hauschka, Dead Sea Magik & Holos, €25 treatments which include massage, reiki, sinus treatment, kinesiology and others such as allergy testing, ear candling, nutritional therapy and hypnotherapy. Make a day of it – have a free health consultation, learn about new products that could benefit your lifestyle and sample healthy delicious foods as well. Every day there will be something different. Don't miss out! Is there a downside to 'detox'? Nutritional therapist Emily Blake answers for CNM (College of Naturopathic Medicine). Detox is about using nutrition and other natural therapies to stimulate our liver and other detoxification organs so they function optimally. It helps us to thrive – to have radiant skin and better energy, mood, hormone balance and memory for example. Supporting detoxification before trying to conceive may also protect future generations from toxin-related illnesses. Keep a bedtime routine – go to bed and get up at the same time every day so that your routine will be less disrupted. And allow your body’s sleep rhythms to become established. Make your bedroom restful – if your room is quiet, dark and not overheated it will be easier for your body and brain to realise it is time to wind down. Avoid screens – remove TVs, laptops and mobile phones from your bedroom. The light these emit can disrupt your sleep patterns. Wind down – by taking a cup of herbal tea, a warm bath, listening to a relaxation CD or relaxing music, reading a book. Avoid alcohol – it may make you feel sleepy, but will ultimately mean you wake up during the night. Avoid napping – daytime nappers often find it leads to night time awakenings. A good night’s sleep should mean you don’t need a daytime nap. Avoid caffeine – have a cut-off time after which you don’t drink caffeinated tea or coffee because it can keep you awake. Take magnesium – it can help the body to relax into sleep. Write tomorrow’s list – it may help to order your mind and organise your thoughts so that you can relax. Optician Vision Express recently commissioned a survey of 1,000 people across Ireland to find out if we take care of our eyesight as we age. The survey revealed that 81% noticed a deterioration in their eyesight when they reached an average age of 42. However, 60% of those over 40, and 52% of those over 60, haven’t had an eye test in over a year, and men are less likely than women to have a regular eye test. Almost 60% of the survey respondents said they struggle when reading, and almost half (49%) said they have difficultly seeing clearly when on the computer or watching TV. Glaucoma is an eye-related disease that mostly affects those over 60. It is symptomless at first and a regular eye test is the only way to detect it. Over 90% of individuals who are diagnosed early will retain some useful sight, but late diagnosis can result in total blindness. A study by researchers from the University of Calgary and University of Waterloo in Canada and published in medical journal JAMA Pediatrics has looked at the correlation between the amount of screen time small children have with their rate of development. The researchers used data from an ongoing cohort study of 2000 mothers and children in Canada. They found that one in four children showed signs of developmental delay and that increased screen time was linked to poorer test scores. They concluded that young children benefit better from a balance in their lives, including reading, interaction with others, playing and physical activity, rather than more screen time. 1 Plan your meals before you go – take five minutes to check what you have in the cupboards, fridge and freezer before you go shopping. Planning what you need for your meals for the next week can save both time and money. 2 Make a shopping list – to help you get what you really need and avoid those impulse buys, especially for unhealthy snacks and treats that can be high in sugar, fat and salt. 3 Be aware of food promotions – while offers for healthy foods like fruit and veg are fantastic, the majority of foods on promotion in supermarkets are unhealthy. You can avoid those by skipping certain aisles, being aware of the end-of-aisle shelfs as ‘watch out’ areas and passing up on promotional offers unless they fit in with your plans. 4 Pester power is an issue – shop alone or with a friend if you can. We’ve all been there, or seen someone else under pressure from children looking for treats while shopping. If you can get some time on your own – take it. 5 Don’t shop when you are hungry – your hunger will be fighting all your good intentions to stick with your healthy choices. If you do have to shop on an empty stomach stick to the list and do your best not to get distracted. 6 Try to avoid shopping when tired or stressed – we all tend to reach for comfort foods to help get us through. Pick a time and a day to shop when you know you’ll be under less pressure. 7 Look at food labels – to help you understand what’s healthy and what’s not. Gradually build up your knowledge of food labelling so you can make sense of it, at a glance. 8 Look for a good balance – make sure you include plenty of fruit and veg, wholegrain and brown carbs over white, and especially watch out for those treats. A quick scan over your trolley before you hit the checkout will help you get a sense of this. The decision to implement 23% VAT on food supplements was taken by the Minister for Finance Paschal Donohoe in the run up to Budget 2018. Health Stores Ireland has launched a campaign to prevent the introduction of 23% VAT on supplements including vitamins, minerals, probiotics, omega-3 and -6 fatty acids and folic acid. This tax is hugely damaging to the health of many vulnerable people who depend on these supplements to maintain a good level of health and standard of living. Even if this is implemented the campaigning will continue past 1 March, so please add your name to the petition to make your voices heard.